Earlier this week I shared with you Part 1 of my top 10 favourite places in the Middle East, so here’s the second half….. Oh-man!!! 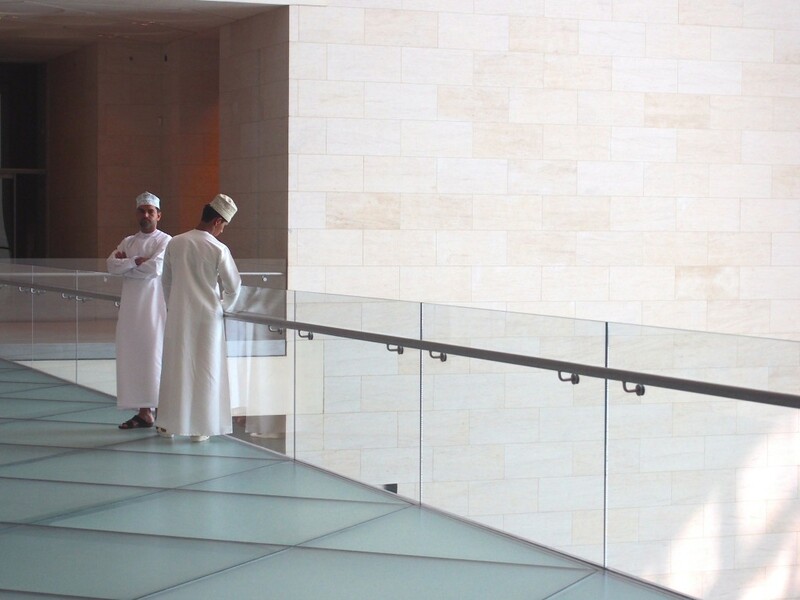 Where to even start about Oman. It’s an amazing country. If you’re at all nervous about visiting a country in the Middle East I would say Oman would be the easiest. I loved it, and truth be told I immediately started looking into nursing positions there after my trip, but alas, there weren’t any at that time. We organized a week long tour that took us all over the country. The Omani coast is spectacular and there are tons of wadis (natural swimming holes) that you hike into and are really cool to explore. 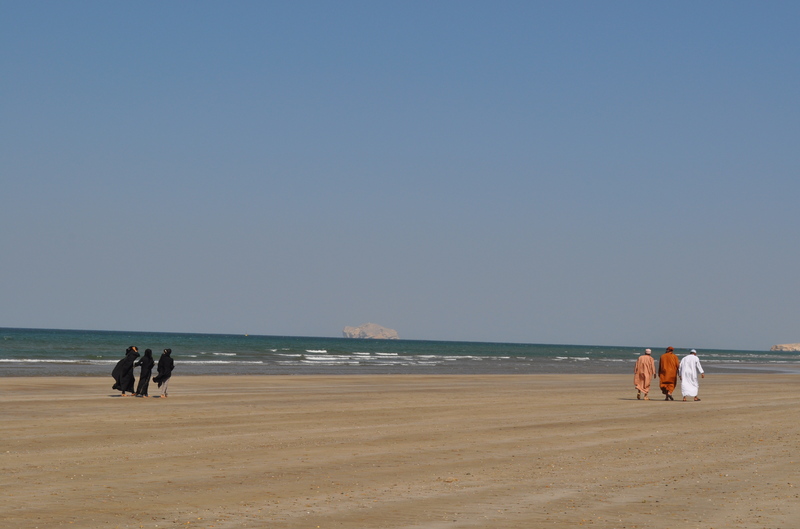 The city of Muscat is built around a harbor surrounded by the Al Hajar mountains to the west. 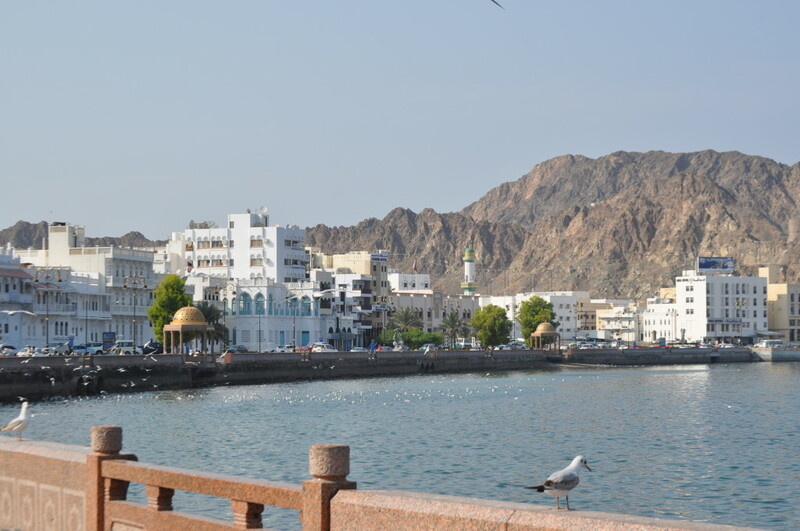 There is a beautiful corniche to wander along, the Old Muttrah souk to explore and many great restaurants. 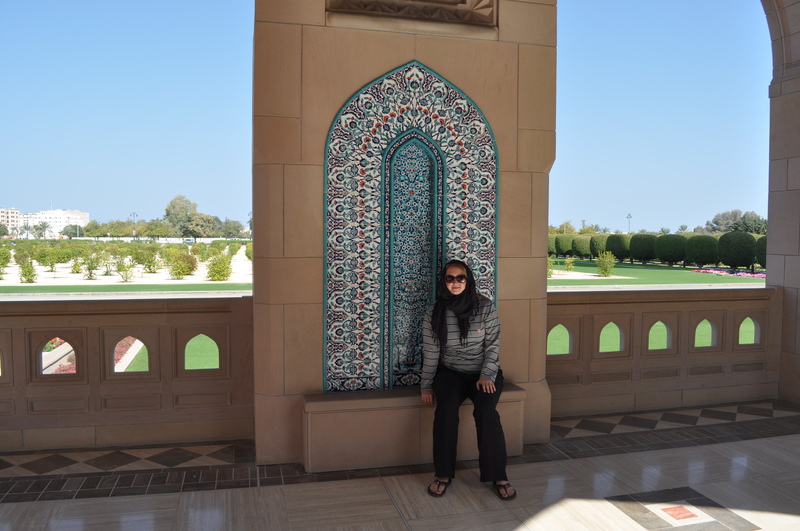 We spent an afternoon visiting the Grand Mosque which was colourful and ornate. Ladies you will need to cover your hair and wear long sleeved tops. Somehow this slipped my mind and I had to spend $30 on an ugly striped mens long sleeve shirt to be allowed in. Sometimes I suffer from complete Middle East amnesia and forget about prayer times, or cultural practices. Showing up at a mosque with a tank top was one such occasion. The deserts in the Arabian peninsula are spectacular. Be it Saudi Arabia, Jordan, or Oman the sand is the most beautiful shade of red or orange and stretches out towards the horizon. If you’re visiting the Middle East it would be a shame to pass up seeing the desert. Bedouins are the local nomadic people, and many still live in the desert although this is much less common than it was even 50 years ago. I would recommend the Red Sands in Saudi Arabia. 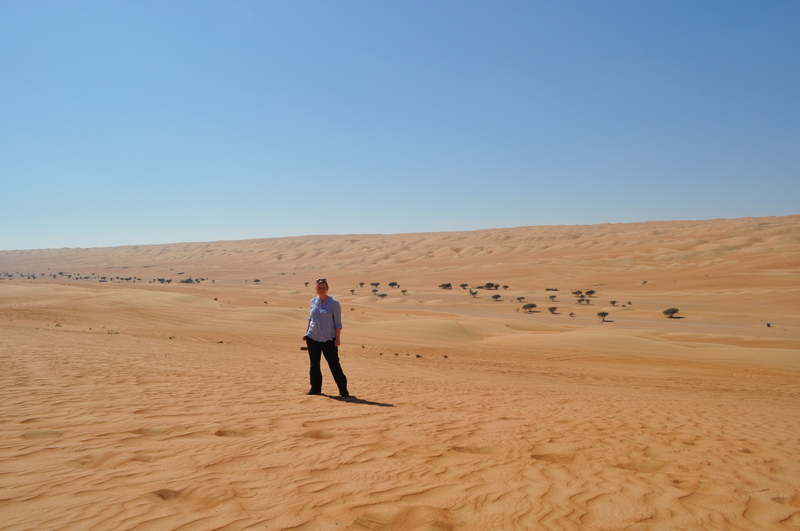 It’s a great place to ride a camel or go ATVing in the sand dunes. 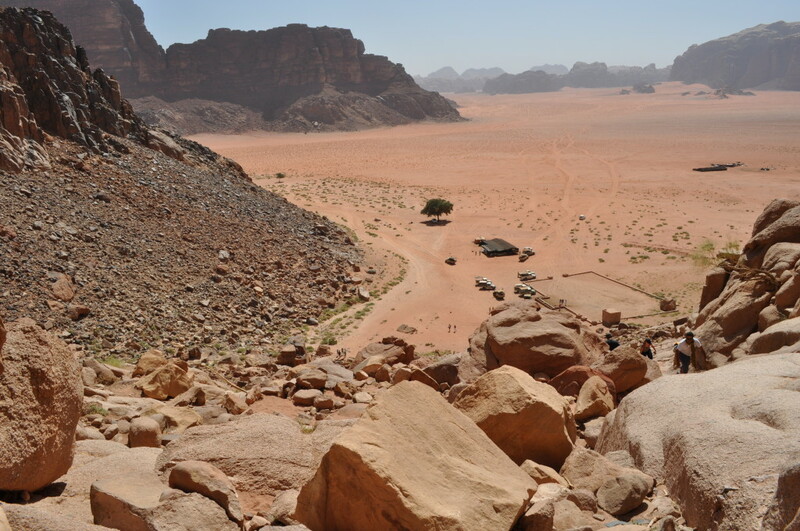 Wadi Rum in southern Jordan is a huge tourist attraction and attracts trekkers, climbers and people like me who visit for the day. We had a local guide and were able to interact with some of the local people which I loved. You can stay overnight in one of the Bedouin camps which I would’ve loved to but we ran out of time. 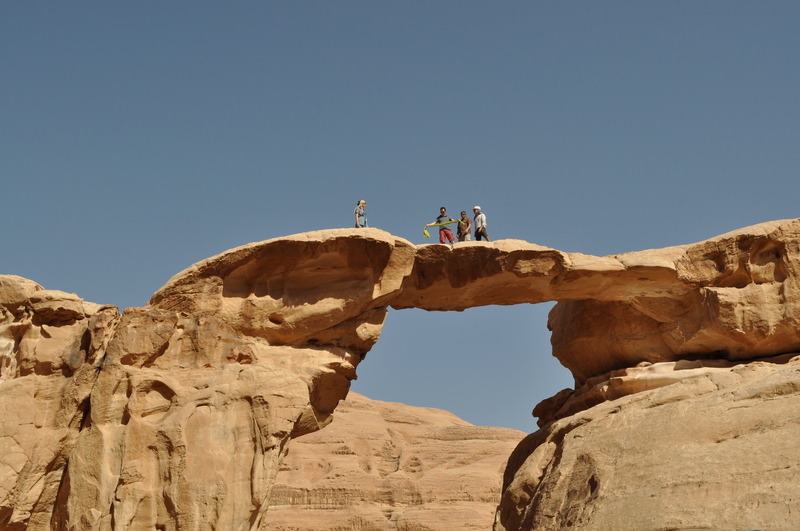 Wadi Rum is surrounded by really cool rock formations and literally every direction you turn is a postcard perfect view. Oman also has beautiful desert areas. We visited Wahiba Sands which is south of Muscat and spent an afternoon 4x4ing over the sand dunes, drinking tea with a Bedouin family, and standing around while our guide tried to fix a flat tire in the soft sand. This had us asking that age old question…….How many Bedouins does it take to change a tire? Good times. Istanbul is a vibrant colourful city. It’s a great landing point for traveling in Turkey and you need at least 3 days to do it justice. Istanbul straddles the Bosphorus strait and essentially has one side in Europe and the other in Asia. 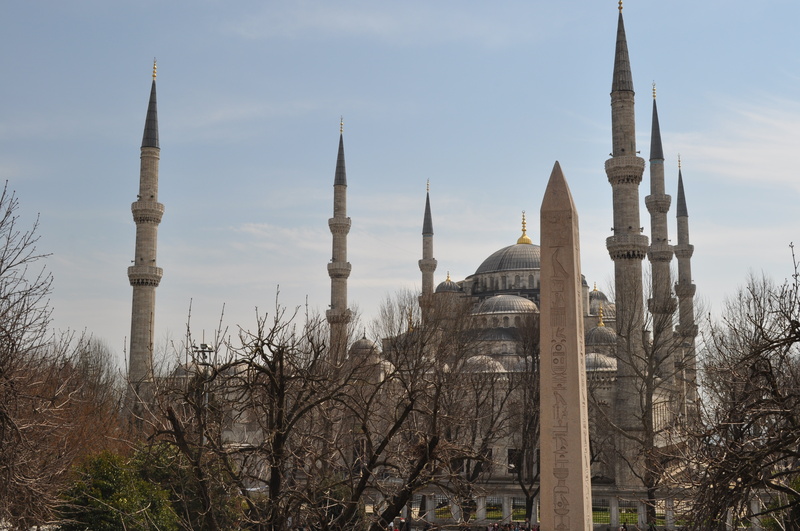 It is a hugely historically significant city that was once a Christian city under Roman rule until it was conquered by the Ottomans and then converted to Islam. There is a ton to see, and so much excellent food to eat. When I went I stayed in the Sultanahment area (old town) which is easy walking distance to the big tourists attractions. Many of the hotels in that area have beautiful rooftop views, so you’ll get to eat your breakfast with a birds eye view of the Blue Mosque. 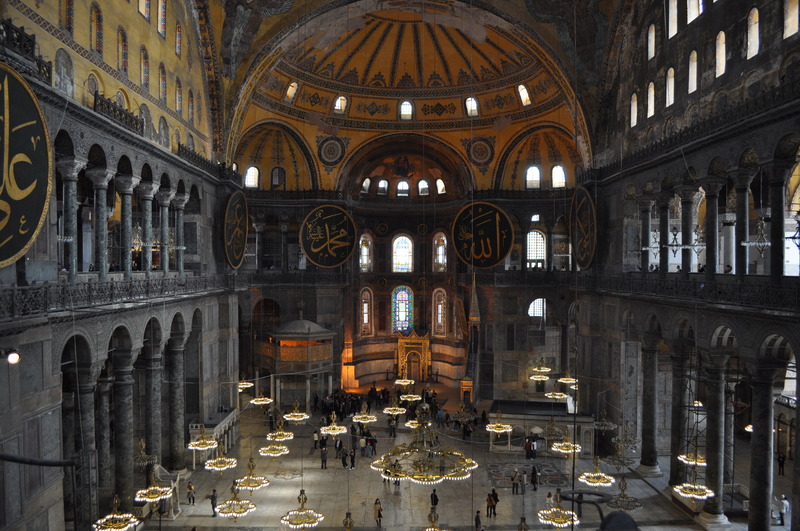 The big highlights of Istanbul for me were the Blue Mosque, Hagia Sophia, Topaki Palace, and the Grand Bazaar. The best and I seriously mean the BEST thing I did while in Istanbul was visit the Basilica Cistern. 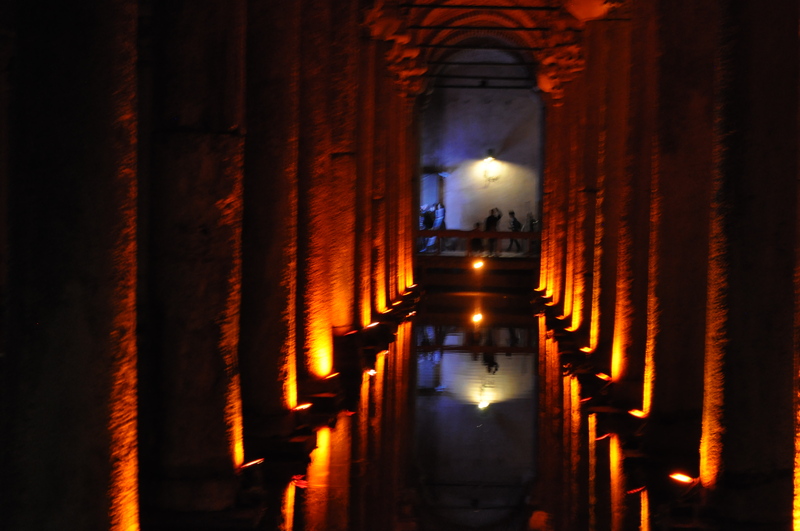 It’s a huge 6th century cistern from the Byzantine times and the lighting makes for beautiful photos. As you can imagine it’s dark and a bit creepy but really cool to explore. Me and my overactive imagination would cringe at the thought of being trapped alone down there though. When you go be on the look out for the 2 carved Medusa pillars. To be fair there’s not a ton to do in Bahrain apart from shopping and drinking, but it does make a great weekend trip to get away from Saudi Arabia. Who knew that there were actually touristy things to do there? Well there’s a fort that also happens to be a UNESCO heritage site believe to date from 2300 BC. 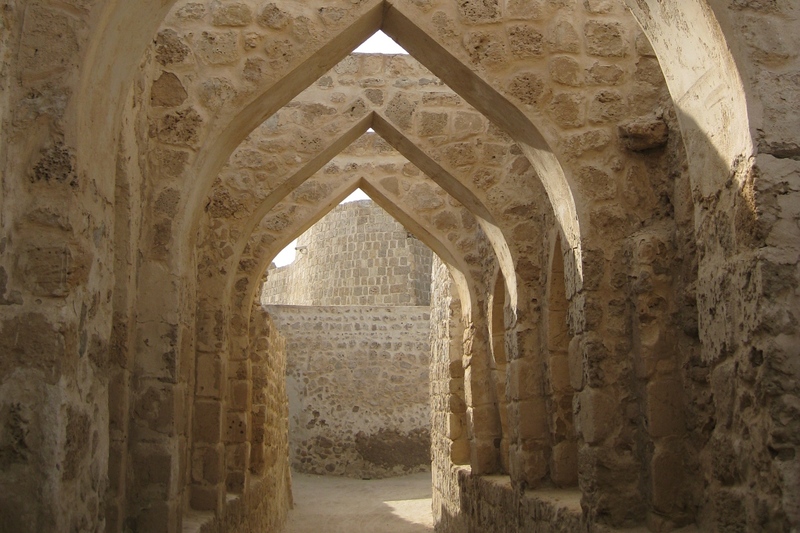 The outer fort is well preserved as are some of the archways and the inner portion looks very much like an archeological site. 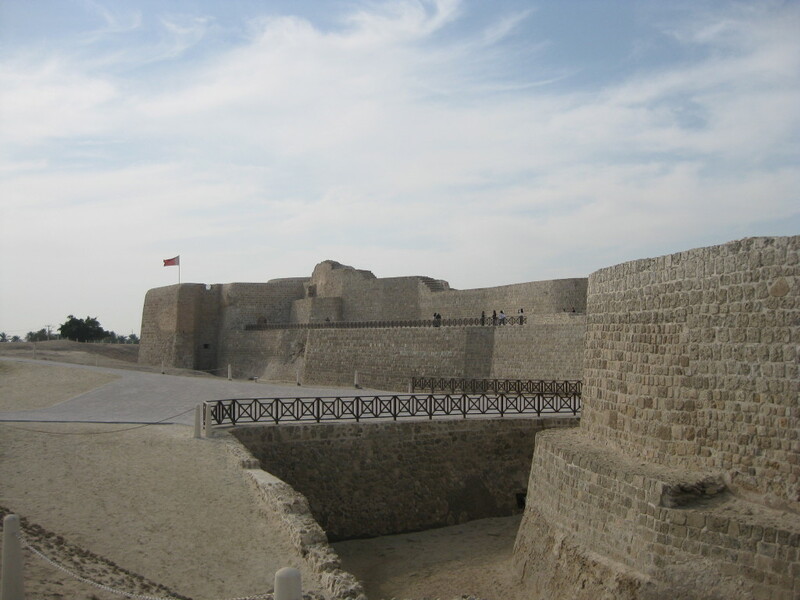 If you need a break from clubbing and shopping in Bahrain take an hour and go explore the fort. There are great city views from there. I’ve already raved about my love for this museum in a previous post which you can read here. I tend to get kinda bored in museums an my eyes glaze over and I’m far too lazy to bother with reading any of the signage around. This museum was the exception though. 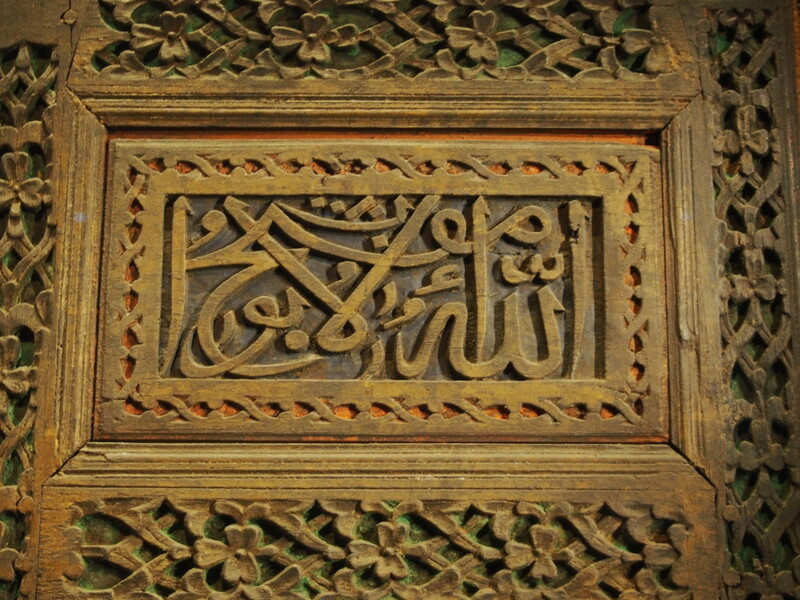 I love Arabic patterns and think that visually Arabic is such a beautiful written language. The museum is bright and open and laid out very well. If I’m ever back in Qatar I would check out this museum again. Oh- the best part. It’s free. I love free. Well that wraps up my Top 10 Middle East recommendations. I could’ve easily made this a top 30 list though, as there are so many wonderful places worth exploring in this region. Have you traveled in the Middle East? What were your top picks? I am also a nurse working in the Dhahran area of the Kingdom..I would love to travel and also experience the wonderful places you are talking about…do you use a travel agency to guide you or do you plan your trips yourself…I am honest…I do not feel confident enough to do it on my own…any suggestions?? Hi Alida! I don’t usually use a travel agent. Most of these trips I took with friends and we would loosely plan out an itinerary before going. If you’re nervous about solo I would recommend looking into Intrepid travel- they do tours in Egypt and Jordan, maybe even Oman. I’m going to Iran with them in April. The other option is to contact a local tour company- we did that for Oman and they laid out an itinerary and all we had to do was book our flights there. Hope this helps! !